How hard will آپ squeal/scream if Natsu and Lucy kissed? 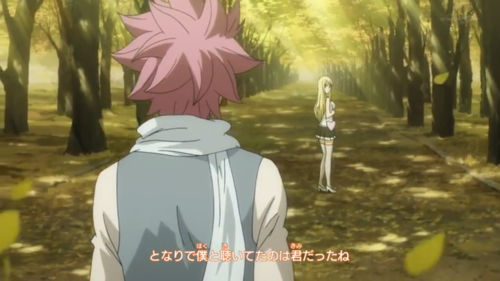 Do آپ think Natsu and Lucy will ever tell what they feel for each other? If Natsu and Lucy like each other who'll be the one to confess first? If Lucy is gone would آپ support NaLi? When did natsu and lucy become a couple? do آپ think natsu will notice that lucy likes her and will like her back? Post as many NaLu hints as possible! - When asked why he gave his protagonists the names of each season (Natsu,Haru), he responded that he wanted non-Japanese readers to learn some words in Japanese. 3)natsu didn't have any fun in the قوس قزح blossom seeing picnic. 5)his dialogue:"just آپ try hurting a single hair on her head cuz i'll turn آپ into smouldering ashes" when she was captured. What's the عنوان of the new Fairy Tail ending (2014)? what are your reasons to think that natsu and lucy like each other?